Share the post "Healthy Natural Honey Cinnamon Ginger Drink"
Benefits of honey are discussed over the years. There are a few “miracle” foods that you should stock up on for emergencies. Among those super foods, honey ranks high on the list. According to a research one teaspoon of honey contains 70 different ingredients. Cinnamon is one of the oldest known spices. It has been consumed since 2000 BC in Ancient Egypt, where it was very highly prized (almost considered to be a panacea). In traditional Chinese medicine, cinnamon has a reputation as a remedy for colds and flu, and is used with tea and fresh ginger. Helps with digestion (due to the content of thiamine), regenerate the nerves and blood. In medieval times doctors used cinnamon to treat conditions such as coughing, arthritis and sore throats. 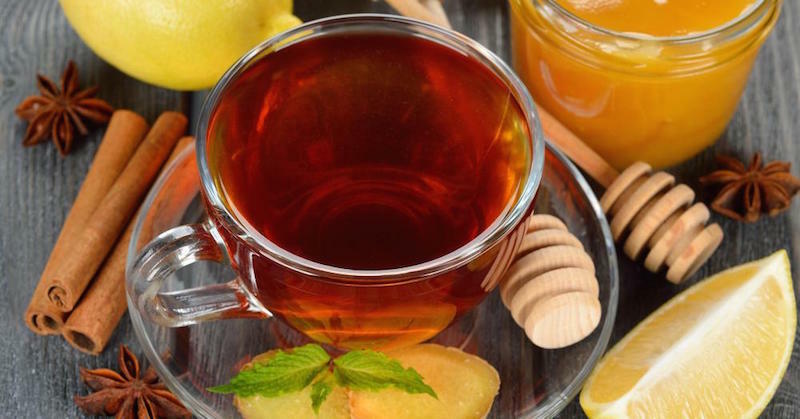 There are the evidences that cinnamon can be the solution for diabetes, candida, weight loss, cancer, Alzheimer’s, toenail fungus, Parkinson’s, stomach flu and much more. Ginger – aromatic, pungent and spicy, ginger adds a special flavor to many fruit and vegetable dishes and drinks. It is among the healthiest (and most delicious) spices on the planet. Ginger has a long history of use for relieving digestive problems such as nausea, loss of appetite, motion sickness and pain. Modern scientific research has revealed that ginger possesses numerous therapeutic properties including antioxidant effects, an ability to inhibit the formation of inflammatory compounds, and direct anti-inflammatory effects. Mix two tablespoons of cinnamon powder and one tablespoon honey in a cup (200 ml). Add grated fresh ginger. Pour one cup boiling water and add three tablespoons of lemon juice and cover the cup (You might just want to use several pieces of the fresh lemon instead). Drink half of the cup before you go to sleep and the other half in the morning. Safety notes: This website is not medical advice, and please check with your doctor before using plants if you are pregnant, using medications or have other health conditions.